A driven well is a well dug vertically by driving in piping directly. 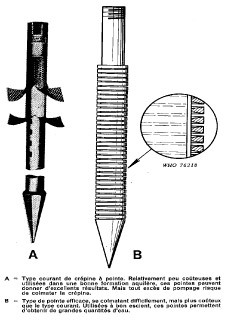 It is a capture engineered structure that consists of a perforated pipe with a pointed end, which is driven by a variety of techniques as far as the water table, in soft of medium-hard ground. Other names are instantaneous well or sand-point well. Driven wells are still frequent today. They are fairly widespread in North America, Southern Asia and Africa. 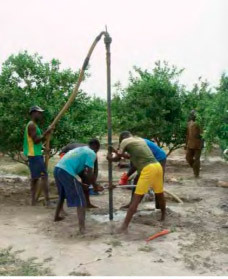 These usually manual techniques are used to provide drinking water to isolated communities that are not covered by the national or regional water supply services and which cannot raise the necessary financing for a mechanised borehole. The populations living in rural areas where there are sufficient groundwater resources. They are constructed by driving, i.e. driving a pipe into the crumbly ground, like sand or gravel. A filter (called a strainer) is very often fixed to the lower part of the pipe. Its function is to allow the water through whilst holding back fine particles from the ground (sand and other particles). A = Common type of point filter. Fairly inexpensive and used in a good aquifer formation, these points can give excellent results. But too much pumping risks clogging the strainer. 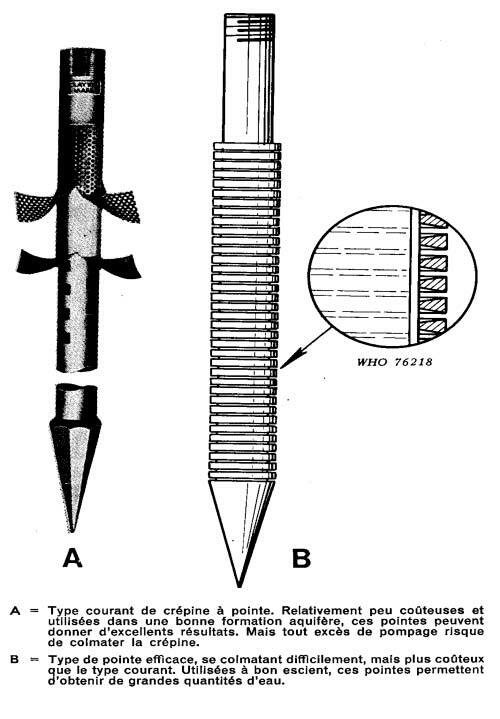 B = Efficient type of point, does not clog easily but more expensive than the common type. Used advisedly, these points can obtain large quantities of water. 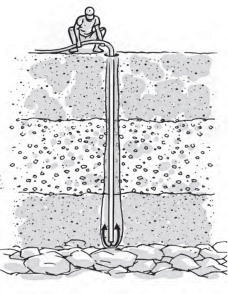 To drive the pipe into the ground, the technique involves using a very heavy tool (the bit) fixed to a rope or cable. The bit is raised and released in succession to let the pipe fall to the end where there is a conical end piece to break up the ground. The height and frequency of the drop varies according to the hardness of the ground. The ground must also be free of stones or rocks. If the tube looks like it might collapse, a preliminary well casing must be inserted and removed when the final pipe is installed. This process can be used to dig small-diameter wells (25 to 100 mm) to depths of less than 15 m or 20 m depending on the hardness of the ground. The process involves injecting water under pressure inside a pipe. A motor-driven pump is used to obtain sufficient pressure. The water wells up at the bottom of the hole outside the pipe walls and rises to the surface of the ground as mud containing the ground cuttings. The pipe is lowered and successive sections of the pipe can be driven in until the desired depth is reached. 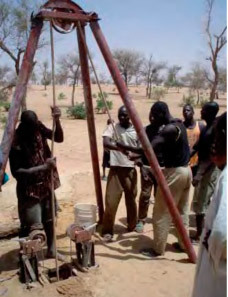 This process is used to dig wells up to around 30 to 40 m deep. This process is also known as the Benoto process. Undercutting involves constructing a circular engineered structure (large pipe) on the ground, then digging inside it to lower it gradually. The large-diameter pipe penetrates the ground under its own weight in this type of driven well. The earth is dug out from inside either manually or with a mechanised bucket which empties the inside of the pipe. The weight of the pipe pushes it downwards as the digging progresses. This process is used to dig wells of large diameter (several metres) to a depth of 15 to 20 metres. 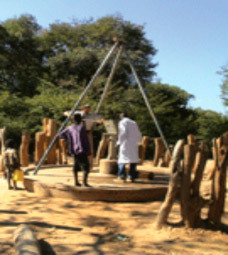 These wells can only draw the water from shallow or average depths (less than 40/45 m). As they are fairly shallow, they are more exposed to contamination and drying out during periods of drought. The various processes all have their advantages and drawbacks. The cost of a driven well varies according to the geology of the location, the technique employed and the purpose of the well (volume of water per day). The range is wide. For a well driven manually, the digging cost is between 100 and 2000 euros. 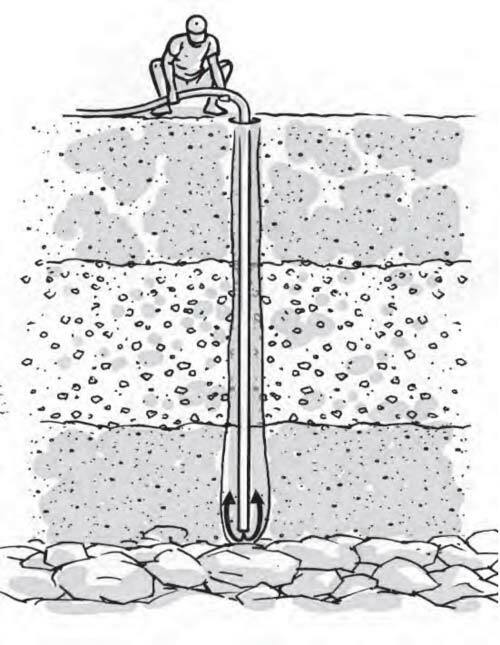 There is sometimes confusion between a driven well (or instantaneous well) and a drilled well which uses similar processes, especially percussion and water jetting (see Sheet E 31 on drilled wells). The main feature of a driven well is that a pipe with a strainer fitted to its end is driven in directly, hence the name instantaneous well.